Now a jewelry artist as shown elsewhere on this web site, Rolliana formerly worked as a classically trained singer, Celtic harper and harpsinger in performance, teaching, recording and music publishing. She specialized in the ancient Celtic traditions, especially of Ireland, Scotland and Wales, medieval and renaissance music and European and American art music, both past and present. 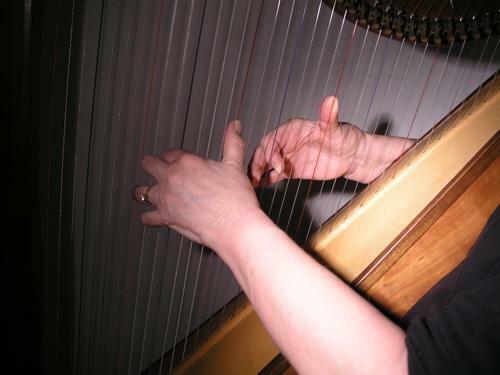 She loved to play her own arrangements, improvisations and original compositions with authentic ornamentation as learned at the Cairde na Cruite harp school and festival in Ireland, summer, 2000. She was the Great Lakes Harpers Professional Division Champion, a Palmer Grant recipient whereby she brought her performances to 80 eldercare facilities in Wisconsin during 1998 and an invited performer and presenter at the 1998 International Society of Folk Harpers and Craftsmen, Inc., (ISFHC) Biennial Conference in Galveston. She founded and directed the Madison Harp Orchestra which performed its debut benefit concert for healthcare, "The Emerald Harp," as a Satellite of the World Harp Orchestra in March, 2006, its second benefit concert "The Harp Weaver", March, 2007, and its third benefit concert, "The Leprechaun King", March 13, 2008. Trained by HospiceCare, Inc., of Madison, Wisconsin, Rolliana used music as a means for seeking wholeness and healing, both for the performer and the listener. She was certified through Laurie Riley's Clinical Musicians Training Program as Advanced Certified Clinical Musician qualified to play professionally at patient bedside in home care, hospice and hospital settings.